Product information "DD ExpandIO External - 6x PCIe Gen 2.0 Expander / Backplane including 2x 180cm Dataport cable"
The backplane is designed for installation in the 5.25" frame of a computer housing, so that over 3x 5.25" slots also PCIe slot cards in full height can be installed in the backplane housing. The communication between the host controller and the backplane is made via two included 50cm Dataport cables and ensures a stable transmission. The cable length can be changed variably. To poweri supply the PCIe backplane and the expanded PCIe slots, the necessary power is provided via a SATA connection directly from the ATX power supply for 3.3V / 1A per slot. For 12V consumers, the supply current depends on the power supply. Note: This article is a set of host controllers and backplane designed for external cabling via the host controller. In the external version of this article, the Dataport cables are routed outside the PC for connection to the backplane. 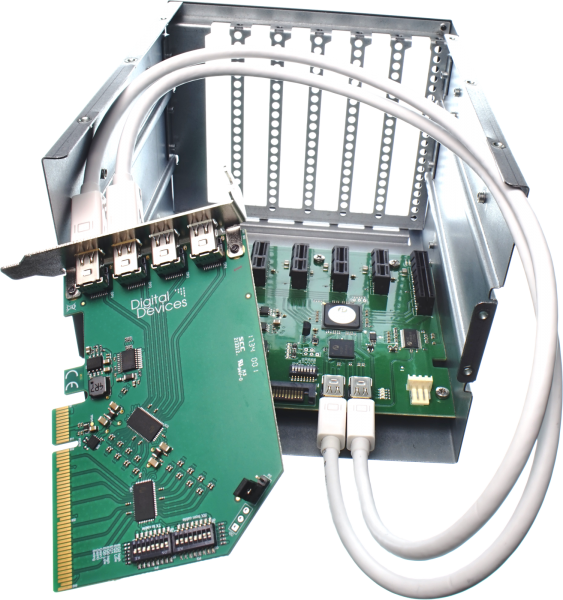 Related links to "DD ExpandIO External - 6x PCIe Gen 2.0 Expander / Backplane including 2x 180cm Dataport cable"